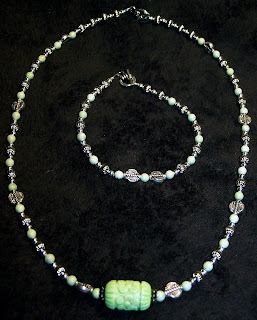 Green chalk turquoise and silver. Love that big bead. Turquoise and silver - my first attempt at earrings. Hope I can remember how to do them again next time! I have been making jewelry for about three weeks now. These are my favorite pieces. In fact, I ordered a sweater to wear with them the other day! 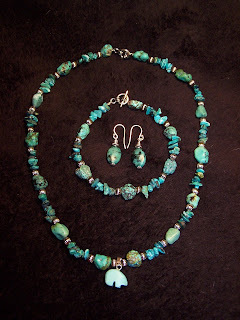 I love the color of the stones and those flat silver beads are just so cute - wish I could remember where I bought them. 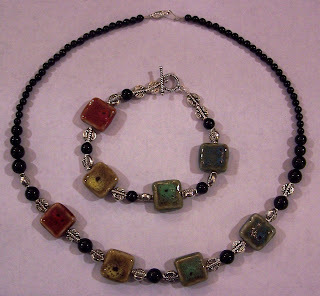 This is just a fun set for me, the pieces are metal, rather than sterling silver. I'm sure you can't tell, I couldn't tell at first until I started looking at them closely, but the swirls in this bracelet are Disney characters. You can make out parts of Mickey, Minnie and Donald Duck. How cool is that. 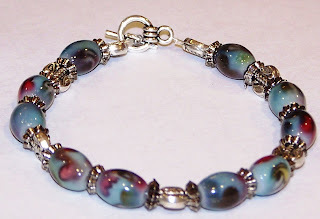 I liked the beads before, but that just adds a whole new level of fun to the bracelet! 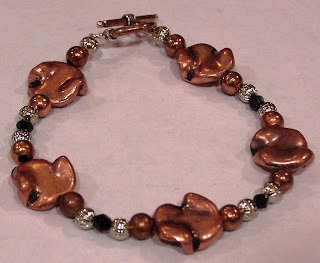 I loved the idea of using copper with silvery. I also added in some Swarovski black bicone crystals. I love that this is so versatile - I could wear it with jeans or with a nice black work outfit. 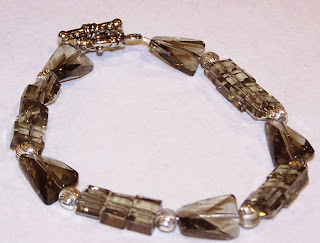 This peice is made with smokey crystals and sterling silver fluted beads. In the right light (not in this photo, LOL), the silver beads almost look like diamonts. 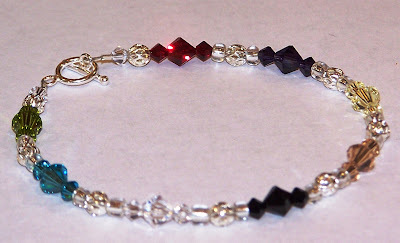 I really like this bracelet and have plans to make a matching necklace. I made this piece just because I thought it was pretty, It's the only piece I have that I'm not that attached to. It's just not my style, although I think it turned out great. 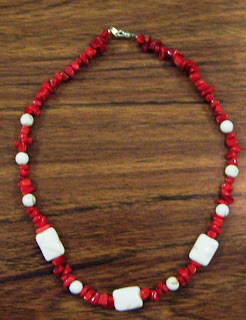 It's hard to tell in the picture, but there are brownish flecks on the white beads. On here, they kind of just look like gum! I'm a single mom of 3. I work for a financial investment firm and while I love my job, I am so glad to come home!!!! I'm a homebody at heart!